World cup – who to support? There was a real kerfuffle this week over Jack McConnell’s comments regarding England at the World Cup. So he won’t be supporting them. No big deal unless your an MP at Westminster hoping to make some petty gain from the statement or Jack Straw still stinging from his demotion. This Stuart Cosgrove quote summed up my feelings. By what weasel arrangement are England fans allowed to dislike Argentina, Germany and France, while we have to snuggle up to them as if history and rivalry meant nothing? This was taken from a Daily Record article which stated his position and his annoyance at the anger around Scots not supporting England. I have much the same view – I won’t be supporting England and it’s not anti-English, racist or whatever anyone else wants to paint it – it’s football and I don’t support them. I support Scotland who are surprisingly missing from this years tournament and hence I want a team that plays good football to win – no great allegiance to anyone. I do know that I don’t want England to win or even do well – they are a rival. There’s also another reason. The most grating aspect of England at the World Cup is the hype and propaganda that the whole country has to suffer in the run up to and during the World Cup, even after they have been kicked out at an early stage (fingers crossed). 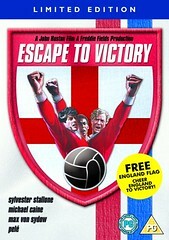 For me summed up by the re-release of Escape To Victory – since when was it England vs Germany – John Wark was playing for them – Pele too. A free England flag as well. Agggggggggggghhhhhhhhhhhhh. Same with Mars now called Believe. This is across of the whole of the UK – not just England. The whole Rooney broken foot saga is also getting out of hand with Alex Ferguson now getting cast as the nasty Scots villain. Tragic. Saying that it’s less than a fortnight until it all kicks off. Can’t wait. I’m hoping for a more open tournament and some real performances from the flair players.